The Pontano Chapel is the small grey building at the western end of Via Tribunali in the historic center of the city (#37 on the map of the historic center). The perfect classic Roman design is attributed to Giocondo da Verona and was built in 1492 by Giovanni Pontano to be a family chapel. Adjacent to that chapel is the church of S. Maria Maggiore della Pietrasanta. 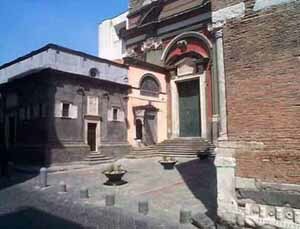 It was built in 533 and is one of the paleo-Christian churches in Naples. Its origins involve one of the weirdest tales of ancient Naples. In 533, the Virgin Mary is said to have appeared to Bishop Pomponius of Naples and commanded him to chase away a swine possessed of the devil that had been frightening citizens of the area. He did and then built and consecrated this church on the site of an earlier temple dedicated to Diana. The church was considered one of the most impressive examples of early Christian architecture. The relatively modern appearance of the church is due to the reconstruction of 1653.The remarkable red-brick belfry (photo, right) on the grounds is the oldest free-standing tower of its kind in Naples. It was part of the original church complex, though built later (c. 900 a.d.). The base of the tower (upper photo) incorporates earlier Roman bits and pieces as construction material, some of which are said to be part of the earlier temple.